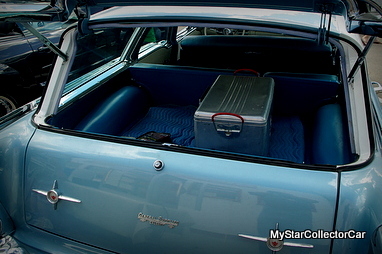 Station wagons are on a huge price spike thanks to Baby Boomer nostalgia for simpler times. 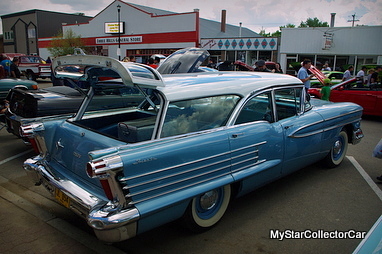 They weren’t cool back in the day but wagons have grafted on a lot of cool over the years. 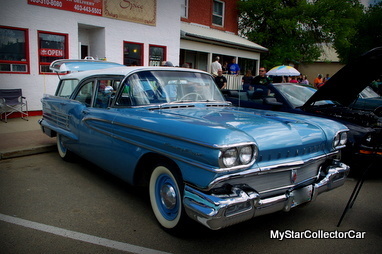 Wagons came in many shapes and sizes but very few had more presence than a 1958 Oldsmobile Eighty Eight. Ron Walder is one of those car guys who bought into the station wagon craze in a big way: “I always wanted a wagon and I was driving to work one day and I saw this car in a field so I stopped in and saw the guy. Everything was complete”. 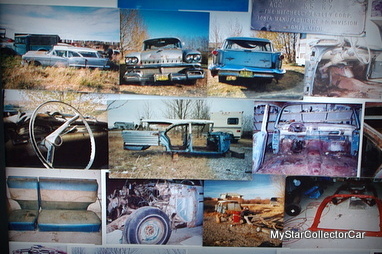 This Olds wagon had a very complete history: “It was his dad’s car from new. He owned a tire shop and he bought it from General Supplies. He ordered a ’57 but it was too late in the year so they gave him a ’58 and that’s why he has #00001. A lot of times they don’t give out the number 1 car”. Despite the rarity of this car Ron wasn’t intimidated by the project but this former field car was a massive job as he explained: “It took ten years, I got so frustrated because you can’t find patch panels for these cars. It took years of going out in the garage and working on the patch panels over and over. I gave up for two years-a lot of guys sell projects like this that are half done I did everything except the pint and engine”. This is a very limited build car as expected: “It’s one of roughly 2450 built. It’s kind of unique because the intake manifold on the 371 is set up for the tri carbs but maybe he got fed up with the extra two barrels. 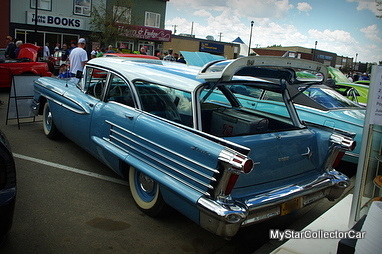 This is a ’58 Olds but it’s such an early build it’s got some ’57 parts on it so that made it more difficult”. Ron is a guy who likes the ‘go’ over the ‘show’ part of the old car equation so this massive wagon sees a fair amount of time on the road so he explained what it was like to drive this Eighty Eight: “It’s a nice ride, really smooth with the Jetaway transmission you can float over speed bumps with it. You can’t feel the road and the bias tires follow the road so I’m thinking about putting radials on it”. 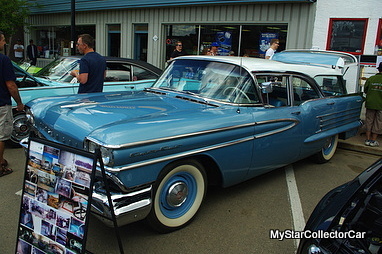 Giant cars from the 1950s weren’t known for their efficient fuel mileage and this Olds ranks low on the miles per gallon file: “It’s terrible-it’s only got a 20 gallon tank so I can’t go from Cochrane to Radium because it only gets 8-10 miles per gallon. The best it’s ever done is 11 miles per gallon”. Ron’s big wagon is rare and valuable so a natural question is about the future of this unique Oldsmobile Eighty Eight wagon and he didn’t hesitate to provide an answer: “I wouldn’t sell it, probably my grandkids will get it”. Surprisingly enough, those grandkids will only be the third owner of this incredible piece of 50s station wagon history. 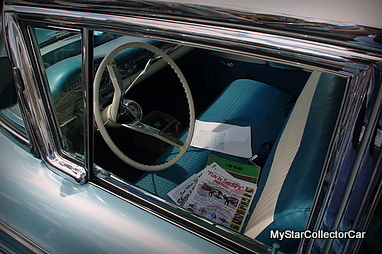 *Re-post if you like this MSCC article…thanks.